Just to beautify the girls, I think…Sometimes these little things, we call them takaghaghquq, we cross it like this before we sew it. It looks so pretty. 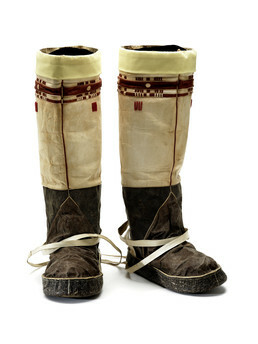 Genevieve Apatiki of Gambell made these high-topped sealskin dress boots for the St. Lawrence Island Dancers in 1982. They are feminine in style with customary red and white patchwork designs (takaghaghquq); vertical red strips down the front; decorative strands of red beads; and straps that attach toward the back and do not pass through a loop as on a man’s boot. The cuffs are yellow cotton cloth.